We protect our assets earned through blood, sweat and tears by filtering diversified and fake businesses. Through a mixture of systematic process and qualitative understanding of the business nature in Asia, we weed out businesses of inferior quality. We subject each management team to a highly stringent ACIDS test and only invest in honest management who are admirable and sincerely doing good for society. We believe in selecting the workhorse architects and builders of their business’ economic moat. In fact, we believe the people driving the business is one of the most critical factors as any “huge cash pile” or “strong profit margins” may disappear overnight if intended, or indeed any “low valuations” may go ever lower should management breach investors’ trust. Conversely, any seemingly “difficult business” or “low margins” may be overcome by the human spirit, and sometimes “high valuations” might remain or go higher as the integrity trait proves ever rare. 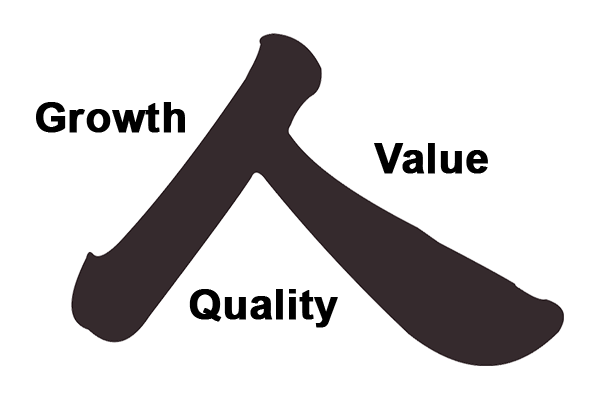 That is why we embedded a 人 character within our logo, to constantly remind us the source of the 3 factors of quality, growth and value. We ask ourselves a simple question – how can operating income double sustainably in 3-5 years? We go beyond the rhetoric by observing the business and management’s track record, and focus on what were the ground work laid by management over years, sometimes decades, as they reach their scaling point. We grow our assets by having the discipline to buy businesses only when they are undervalued or fairly valued for a fast growing one. When sometimes such companies’ growth potential has already been fully redeemed by market exuberance or high(er) expectations, we keep these high-quality businesses in our watchlist. We believe having an investing discipline is equally important as finding the gems. While theoretically there are no upper limits to a stock price, we remind ourselves that a drop from any high point will likely hurt and prioritise a good night’s sleep over daily price excitement. We live our lives as an inspiration to fellow investors, especially those starting form the bottom like how we first started, that there is a sustainable path in building wealth. We believe there is no need to profit at the expense of others, and we can truly win together. We hold ourselves accountable as responsible capital allocators and believe that when fellow investors collectively shine light onto the good sustainable businesses, more companies may be encouraged to do good and improve.